ANDERSON, SC (February 22, 2018) – The National Dropout Prevention Network (NDPN) is pleased to announce that Lori Lamb, Director of Alternative Education for the Arkansas Department of Education, has been selected for a 2017 National Dropout Prevention Network Crystal Star Awards of Excellence in Dropout Recovery, Intervention, and Prevention individual award. This annual award identifies and brings national recognition to outstanding individuals who have made significant contributions to the advancement of dropout prevention, intervention, recovery and reentry and that represent best practices in the field. Lori Lamb is described by peers as a visionary with a diverse range of leadership skills. Lamb served as past regional director, vice president, and president of the National Alternative Education Association, working to advance alternative education legislatively, both in the state of Arkansas and nationally. Additionally, lamb worked to strengthen alternative education by developing research-based guidelines and indicators to assist programs nationally in designing, implementing, and evaluating alternative education programs. As Director of Alternative Education for the Arkansas Department of Education, Lamb works with dropout prevention, intervention, and recovery efforts by serving 22 school districts in her role as an educational partner to all Arkansas school superintendents. She develops and presents organizational structures that allow schools to cultivate learning environments to provide authentic teaching and learning. Lamb has been in education for 34 years. She is a former foster child and, in partnership with her husband, has been a foster parent for 25 young people throughout her career. She has a passion for developing positive role models for all at-risk children that permeates her professional and her personal life. Lamb accepted her Individual Crystal Star Award at the 2018 At-Risk Youth National FORUM in Myrtle Beach. Established in 1986 with a mission to reduce dropout rates, the NDPC shares solutions for student success and dropout prevention through its clearinghouse function, active research and evaluation projects, publications and a variety of professional development activities and conferences. The organization’s website—www.dropoutprevention.org—is the nation’s leading resource in providing effective, research-based solutions to engaging students and reducing dropout. 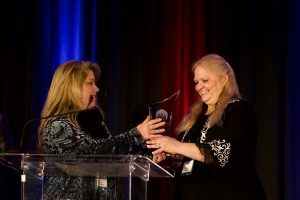 Photo Caption: Dr. Pamela Bruening (left) with 2017 Crystal Star Award Recipient Lori Lamb, Director of Alternative Education for the Arkansas Department of Education.